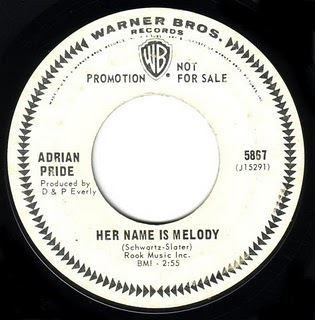 Name: Adrian Pride was a pseudonym for Bernie Schwartz (not to be confused with actor Tony Curtis who was born Bernard Schwartz) that was created by producer (at the time) Phil Everly of the Everly Brothers. Apparently, people do not like the name Bernie Schwartz. Like I said above, Adrian Pride was the false name of Bernie Schwartz, a West Coast musician with Psychedelic Pop aspirations. And while Adrian Pride does sound like an awesome, but corny superhero, Schwartz only recorded under the name once. Yes, once. He used Pride for his dreamy meditation “Her Name is Melody,” an apt title for a song that attempts to lure listeners into its constant rhythm, eastern guitar and melodic vocals. This example of psychedelic pop is from 1966 and was produced by The Everly Brothers. Well all you have to do is dream, dream, dream. Right? I couldn’t help it. Unfortunately, “Her Name is Melody” (and its B-side “I Go To Sleep” – Kinks cover) did not chart and fell off into the realm of psychedelic nuggets of the late 60s. It was picked up by a compilation CD and you can still hear it today if you search for rare psychedelic gems. After his Adrian Pride phase, Schwartz became one of the vocalists for late 60s band Comfortable Chair, yet another obscure West Coast psychedelic sunshine band. And while The Everly Brothers originally produced Schwartz’s music, Jim Morrison of the Doors found Comfortable Chair and Doors’ drummer John Densmore and Doors’ guitarist Robbie Kreiger happened to produce Comfortable Chair’s first album in 1969. The album went nowhere and the band found no success outside of the sinking late 60’s psychedelic scene. It’s an absolute pleasure to write about 60’s music. Thanks for the comment! Hipmunk differentiates from the run-of-the-mill flight search applications by predicting how painful your traveling might be. keyboard and the touchscreen. Controls are just a matter of tapping on boat in order to make them jump straight into the boat.